Serve the lamb shanks with couscous and steamed green vegetables. 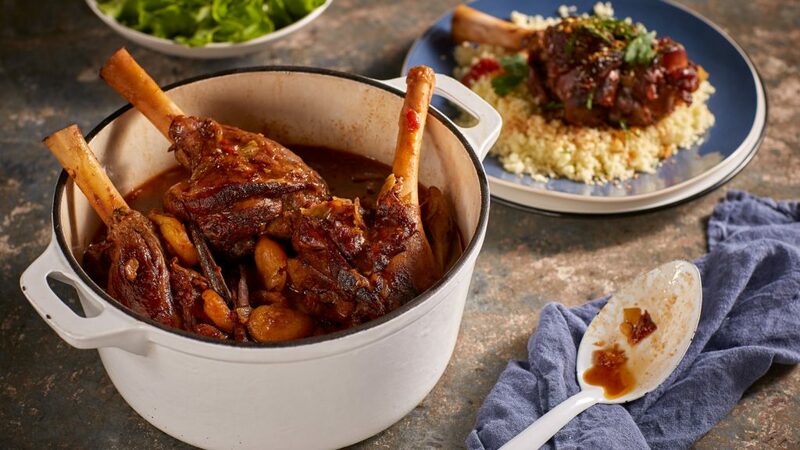 Tender lamb shanks are impossible to resist when the meat is falling of the bone. These shanks are cooked with Moroccan flavours and are best served on a steamy bed of couscous. Preheat the oven on CircoTherm® Eco to 140⁰C. Place a wire rack on shelf level 2. Heat half of the olive oil in a large heavy based flameproof casserole or baking dish. Cook half the lamb shanks until evenly browned all over. Repeat with remaining oil and lamb shanks. Set shanks aside. Over a medium heat add the onion, leek and garlic and cook for 3 minutes or until onion is soft and golden. Add cumin, coriander, harissa, cinnamon and saffron and cook for 2 minutes or until fragrant. Add the white wine, orange zest and juice and continue to cook for a further 3 minutes. Add the apricot, dates, tomatoes and chicken stock and bring to the boil. Return the lamb shanks and stir to combine all the ingredients. Cover the lamb shanks and then place in the oven. Cook for 3 – 4 hours or until the meat is tender and falling off the bone. Remove from the oven. Carefully remove the shanks from the sauce. Over a medium heat on the cooktop, boil the sauce for 5-10 minutes to reduce and thicken. Skim excess fat. Return lamb shanks and cook for 5 minutes to ensure lamb shanks are heated through. Garnish lamb shanks with parsley and coriander. Sprinkle with dukkha and serve. With features you won’t find anywhere else, NEFF appliances are designed to give food enthusiasts a more rewarding cooking experience. CircoTherm® lets you cook, roast and bake on all levels simultaneously, without mixing flavours. It’s an entertainer’s dream. This recipe is prepared with NEFF’s CircoTherm® Eco. | We use Australian tablespoons and cups: 1 teaspoon equals 5 ml; 1 tablespoon equals 20 ml; 1 cup equals 250 ml. | All herbs are fresh (unless specified) and cups are lightly packed. | All vegetables are medium size and peeled, unless specified. | All eggs are 55–60 g, unless specified. 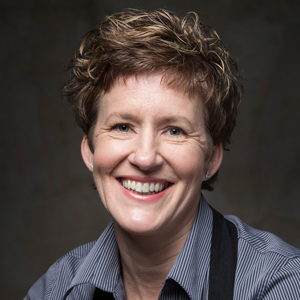 As a trained Home Economist and Chef, Fransje knows that good cooking comes from confidence in the kitchen. With 27 years of industry experience, Fransje can help you decode the appliance manual and share some delicious dishes.